The body of an adult Scutigera coleoptrata is 25 to 35 mm (0.98 to 1.38 in) in length. Up to 15 pairs of long legs are attached to the rigid body. Together with the antennae they give the centipede an appearance of being 75 to 100 mm (3 to 4 in) in length. The delicate legs enable it to reach surprising speeds of up to 0.4 meters per second (1.3 ft/s) running across floors, up walls and along ceilings. Its body is yellowish-grey and has three dark dorsal stripes running down its length; the legs also have dark stripes. S. coleoptrata has developed automimicry in that its tail-like hind legs present the appearance of antennae. When the centipede is at rest, it is not easy to tell its front from its back. Unlike most other centipedes, house centipedes and their close relatives have well-developed faceted eyes. House centipedes lay their eggs in spring. In a laboratory observation of 24 house centipedes, an average of 63 and a maximum of 151 eggs were laid. As with many other arthropods, the larvae look like miniature versions of the adult, albeit with fewer legs. Young centipedes have four pairs of legs when they are hatched. They gain a new pair with the first molting, and two pairs with each of their five subsequent moltings. Adults with 15 pairs of legs retain that number through three more molting stages (sequence 4-5-7-9-11-13-15-15-15-15 pairs). House centipedes live anywhere from three to seven years, depending on the environment. They can start breeding in their third year. To begin mating, the male and female circle around each other. They initiate contact with their antennae. The male deposits his sperm on the ground and the female then uses it to fertilize her eggs. House centipedes feed on spiders, bed bugs, termites, cockroaches, silverfish, ants, and other household arthropods. They administer venom through forcipules. These are not part of their mandibles, so strictly speaking they sting rather than bite. They are mostly nocturnal hunters. Despite their developed eyes, they seem to rely mostly on their antennae when hunting. Their antennae are sensitive to both smells and tactile information. They use both their mandibles and their legs for holding prey. This way they can deal with several small insects at the same time. To capture prey they either jump onto it or use their legs in a technique described as "lassoing". Outdoors, house centipedes prefer to live in cool, damp places. Centipede respiratory systems do not provide any mechanism for shutting the spiracles, and that is why they need an environment that protects them from dehydration and excessive cold. Most live outside, primarily under large rocks, piles of wood, and especially in compost piles. 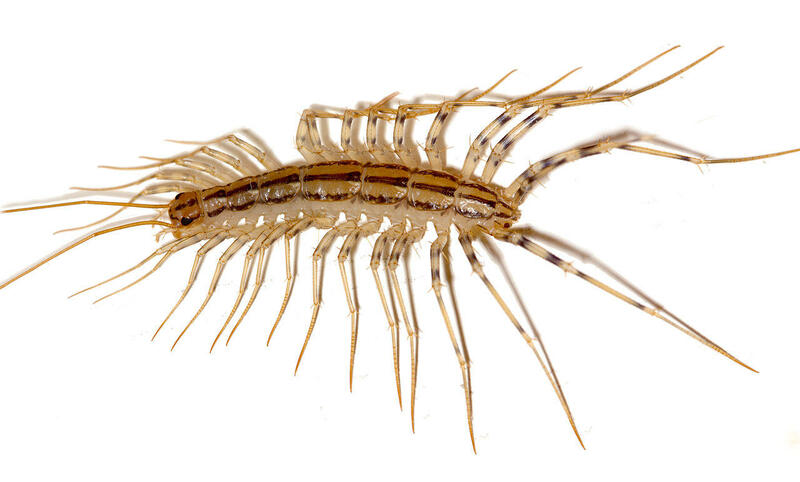 Within the home, these centipedes are found in almost any part of the house. Most commonly they are encountered in basements, bathrooms, and lavatories, which tend to be humid, but they can also be found in drier places like offices, bedrooms and dining rooms. The greatest likelihood of encountering them is in spring, when they come out because the weather gets warmer, and in autumn/fall, when the cooling weather forces them to find shelter in human habitats.The Indian meal moth, a common house-infesting moth, often is confused with the clothes moth. However, it does not attack clothing but rather is associated with dried food. Indian meal moth adults are darker on one half of the body.